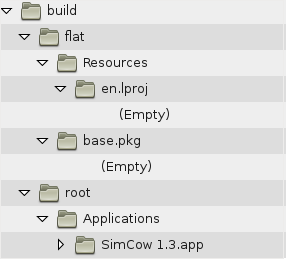 Let us assume that we are an employee of a company named ProFarms Ltd. that has created a Mac OS X application called SimCow 1.3. We would like to deploy our product in a Mac OS X installer package. Notice that we told cpio to override the user and group id. This is very important as your linux user and group ids will most certainly not match with the required user and group root/wheel (0/80) which Mac OS X requires. where the latter is the payload size in bytes. In the above command, note that we are once again overriding the user and group identifiers. As mentioned above, on Mac OS X the user and group id must be 0/80. The -u and -g options allow us to conveniently set these values. Great! We are done with the base.pkg, however there are still a few more files left in the flat package directory - all are very straight-forward. 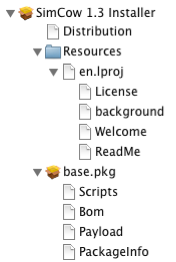 You will also need to create the License, Welcome, ReadMe and background files in the flat/Resources/en.lproj folder. The text files need to be in .rtf format (for example use AbiWord). The background image file is a .png file. Note, that you must not compress the flat package installer. The PayLoad has already been compressed and compressing the flat package again will create a broken installer. That's it. You now have a Mac OS X installer package!